Each template has a color scheme, stock images and widgets that are displayed in different areas of the website. Widgets can be used for header, footer and home page content. The content used in the widgets comes from the information entered in the Profile. You can also change the content by clicking the widget. Select a template that has widgets where you want. You can select to hide the widgets that you don't want to use. 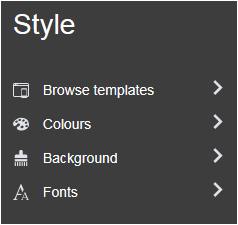 You can create the custom look you want from the Style Menu. Change your template and your content will automatically format to the new template. Choose a template based on the available widgets. Select a new color scheme or create your own. The background can be solid, gradient, or an image. Choose different font styles for headers and page text.